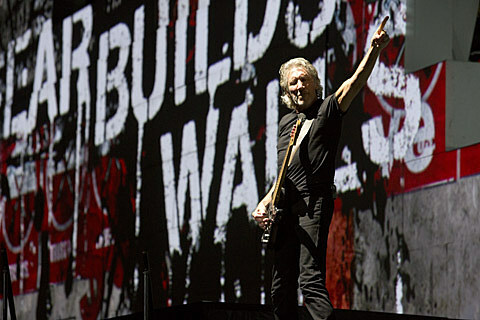 Roger Waters has been added to the big “Love for Levon” tribute that goes down next week (10/3) at the Izod Center. The onetime Pink Floyd guitarist/vocalist joins the likes of Gregg Allman, John Mayer, My Morning Jacket, John Prine, Warren Hayes, Garth Hudson, Grace Potter and more in the all-star band that will celebrate the life and music of Levon Helm who lost his battle with cancer back in April. A full list of performers for “Love for Levon” is below. Tickets are still available and please remember that the whole show is a benefit with net proceeds from the concert helping support “the lasting legacy of Levon Helm by helping his estate keep ownership of his home, barn and studio, and to continue The Midnight Ramble Sessions.” We are, however, also giving a pair away. Details on how to enter are below. For a chance at winning a pair of tickets to see “LOVE FOR LEON” AT THE IZOD CENTER: either tweet something that includes both @BrooklynVegan AND “LOVE FOR LEVON” in the tweet, or send an email to BVCONTESTS@HOTMAIL.COM with the subject line “BAND”. Include your first and last name in the email. We’ll pick a winner at random and contact them with more details. If you enter by email, it will not be shared with anyone else. Good luck!